We present a new convolutional neural network-based time-series model. Typical convolutional neural network (CNN) architectures rely on the use of max-pooling operators in between layers, which leads to reduced resolution at the top layers. Instead, in this work we consider a fully convolutional network (FCN) architecture that uses causal filtering operations, and allows for the rate of the output signal to be the same as that of the input signal. We furthermore propose an undecimated version of the FCN, which we refer to as the undecimated fully convolutional neural network (UFCNN), and is motivated by the undecimated wavelet transform. Our experimental results verify that using the undecimated version of the FCN is necessary in order to allow for effective time-series modeling. The UFCNN has several advantages compared to other time-series models such as the recurrent neural network (RNN) and long short-term memory (LSTM), since it does not suffer from either the vanishing or exploding gradients problems, and is therefore easier to train. Convolution operations can also be implemented more efficiently compared to the recursion that is involved in RNN-based models. We evaluate the performance of our model in a synthetic target tracking task using bearing only measurements generated from a state-space model, a probabilistic modeling of polyphonic music sequences problem, and a high frequency trading task using a time-series of ask/bid quotes and their corresponding volumes. Our experimental results using synthetic and real datasets verify the significant advantages of the UFCNN compared to the RNN and LSTM baselines. Head movement during scanning impedes activation detection in fMRI studies. Head motion in fMRI acquired using slice-based Echo Planar Imaging (EPI) can be estimated and compensated by aligning the images onto a reference volume through image registration. However, registering EPI images volume to volume fails to consider head motion between slices, which may lead to severely biased head motion estimates. Slice-to-volume registration can be used to estimate motion parameters for each slice by more accurately representing the image acquisition sequence. However, accurate slice to volume mapping is dependent on the information content of the slices: middle slices are information rich, while edge slides are information poor and more prone to distortion. 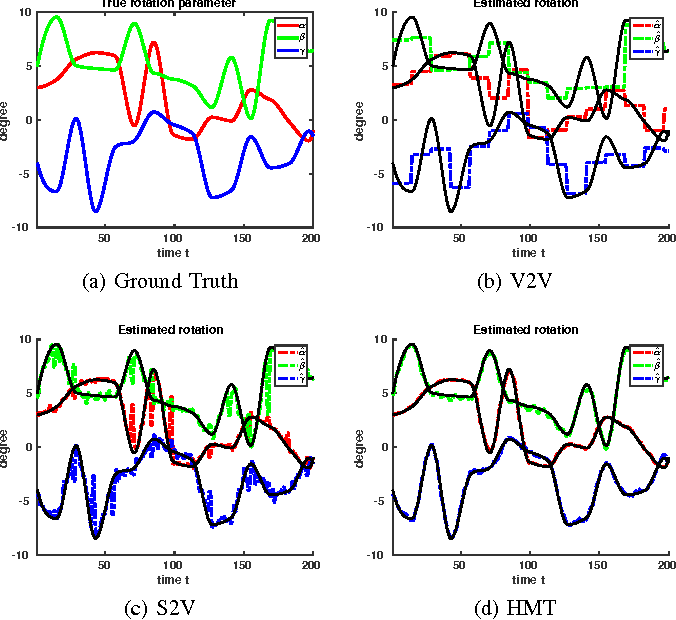 In this work, we propose a Gaussian particle filter based head motion tracking algorithm to reduce the image misregistration errors. The algorithm uses a dynamic state space model of head motion with an observation equation that models continuous slice acquisition of the scanner. Under this model the particle filter provides more accurate motion estimates and voxel position estimates. We demonstrate significant performance improvement of the proposed approach as compared to registration-only methods of head motion estimation and brain activation detection.